Last Night, VEVO presented a private “Six Feet Deep” 3D experience at Hollywood Forever Cemetery powered by Dubset. Guests were handed 3D glasses when they arrived to enjoy the world’s first-ever private 3D experience with a celebrity DJ performance and were treated to snacks by popchips and an open bar with Belvedere cocktails. In addition to the live DJ performance, guests watched a special video tribute to DJ AM provided by Dubset. Costumes were judged by the souls who lay still six feet deep and prizes were awarded for best costumes. Jamie King was captured snacking on popchips and hanging out with Topher Grace at the Halloween party held at the last night. The 2 arrived together (with 2 other people) around 9:30 and hung out with the crowds till after midnight. They were spotted mingling with the crowds and fighting with light swords. 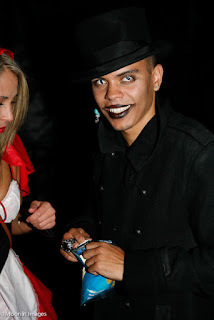 Evan Ross, showed up dressed as a vampire and was seen hanging out near the dj booth as Joel and Benji Madden rocked the party and snacked on popchips in the dj booth. Other party guests included Paris Hilton, dressed as mini mouse, Nicky Hilton and Brandon Davis who all arrived together; the latter were not dressed in costume. They were hanging out at a table off the dance floor, running through the crowd and dancing till about 1. Special Thanks to Andrew Price and Moonlit Images!